Lambs are a popular model for studying prenatal humans because their development in the womb is similar to ours but sped along. Compared to the nine-month gestation period for humans, healthy newborn lambs are typically delivered in 150 days, or slightly less than five months. 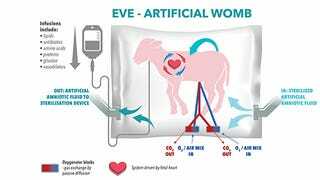 So far, studies of artificial wombs, including the team’s earlier experiments with EVE, have used lambs at around 107 to 115 days of development. That time period roughly equates to late-term premature human babies. But while these children definitely need special care once delivered, modern medicine is already good at keeping them alive, with survival rates ranging around 90 percent. We’re much less capable of keeping alive babies born between 22 to 24 weeks of development, a period considered the border of viability. And it’s these children who would benefit most from an artificial womb that can bridge the crucial gap to normal development if it ever became reality. The team behind this new study, published this month in The American Journal of Obstetrics & Gynecology (AJOG), say theirs is the first documented attempt to successfully reach this extra step with lambs. Eight lamb fetuses at 95 days of development were placed inside EVE for 120 hours, or roughly five days. Their health was compared to a control group of lamb fetuses at 100 days of development. Ultimately, seven of the extremely premature lamb fetuses survived the entire five days of EVE therapy. These survivors were just as healthy and developed as the control group was, indicating that EVE was able to mimic the conditions of the womb well enough even for these especially fragile fetuses. In order to compare them, both groups were euthanized at 100 days. Kemp’s team isn’t the only one that has made great strides recently in refining the artificial womb, a concept that’s existed theoretically for decades. Researchers at Children’s Hospital of Philadelphia published research on their own artificial womb, the Biobag, in 2017. They claimed their technology could support lamb fetuses for as long as 28 days, and successfully led to normally developed lambs that, as of 2017, were still alive and thriving. “There is no technology, even on the horizon, that can support the fetus from the embryonic stage,” Alan Flake from the Children’s Hospital of Philadelphia, said at the time of their study’s release in 2017.